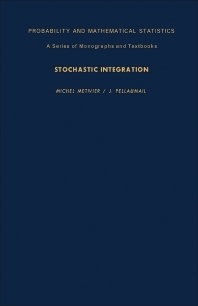 Probability and Mathematical Statistics: A Series of Monographs and Textbooks: Stochastic Integration focuses on the processes, methodologies, and approaches involved in stochastic integration. The publication first takes a look at the Ito formula, stochastic integral equations, and martingales and semimartingales. Discussions focus on Meyer process and decomposition theorem, inequalities, examples of stochastic differential equations, general stochastic integral equations, and applications of the Ito formula. The text then elaborates on stochastic measures, including stochastic measures and related integration and the Riesz representation theorem. The manuscript tackles the special features of infinite dimensional stochastic integration, as well as the isometric integral of a Hubert-valued square integrable martingale, cylindrical processes, and stochastic integral with respect to 2-cylindrical martingales with finite quadratic variation. The book is a valuable reference for mathematicians and researchers interested in stochastic integration.